If you’re looking for the perfect gift to give to your favorite gal (or to get for yourself) this holiday season, look no further than Eve’s Addiction’s Ruby Red Enamel Ring. This ring is perfect for the holiday season because it is both classy and sophisticated, yet at the same time fun to have it wrapped around your pretty little finger. This red enamel ring comes with a vintage design of flowers which can go well with a little black dress and pumps with red lipstick or with your favorite red shirt, a nice pair of dressy pants and a good pair of boots. 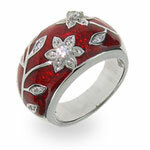 With a little bit of make-up and red lipstick along with a nice dressy and/or Christmas outfit, this beautiful Ruby Red Enamel Ring with the Vintage CZ Flower Design is perfect for anything from your next Christmas office party to a Christmas get-together at your neighbors’ or at your family gathering this Christmas. Wow. I like this gift for valentine .